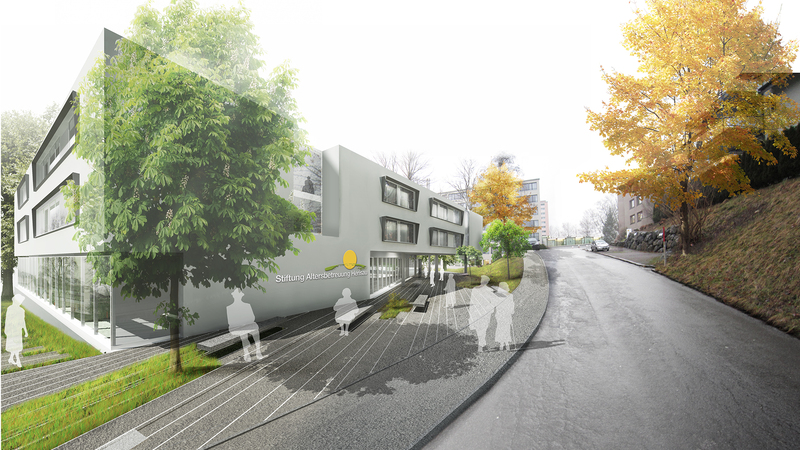 he competition aims to renovate the existing elderly house in Herisau. The building is completely maintained, while the extension is clearly recognisable by its architectonical language. The new construction is situated in the eastern part of the area of which it follows the morphology with the new main entrance situated at the same level of the existing one. Close to it, is a suspended walkway which connects the new addition to the existing building. The sinuous contour of the new building allows a strong indoor/outdoor relation. A central court increases the lightness and airiness of the rooms, with the levels facing the court gradually raising. The final level hosts a terraced garden, which facing the West, enjoys optimal orientation and view.A pedestrian path runs around the whole building, surrounded by a rich vegetation, trying to improve the stay of the users and visitors of the centre.